We spent our Halloween discussing grant funding at Boo! 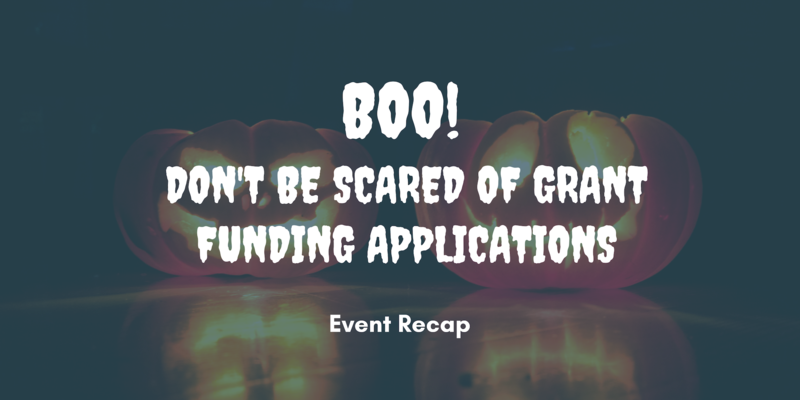 Don't be Scared of Grant Funding Applications this week! Our exclusive sponsors Granted Consultancy – who specialise in identifying and securing non-dilutive funding – took our attendees through the ins and outs of the grant application requirements and process, the different types of schemes available, as well as some general success tips. Guest speaker Dom Icely from the IP Asset Partnership also explained how you can increase the value of your business through the protection of intellectual property. Grants – cover your future R&D project costs for developing a new innovative market solution. If you have capital requirements in your organisation going forward, it might be a good idea to plan ahead. R&D tax credits – cover past innovation spend, and are an exceptional way to get some money back (around 30% of eligible costs) for high risk research and development. When receiving a grant, the funder will not ask for any equity in your business, and there's no debt involved. This is essentially as close as you will get to free money, though there are some strong requirements involved, and a lot of time has to be invested into the application process. Grant funding can further help you work with academic partners, as well as other potential advisers whose expertise can significantly help your business. · You will need to specify a project and its future start date. The duration of projects can range from 3-36 months. · Grants can cover anything from 50-100% of project costs, with the typical amount for R&D projects being 70%. This means you still have to find the remaining 30% externally. · You're going to have to prove the spend which you've detailed, including staff, overheads, material, capital, subcontractors & travel. · Don't underestimate the level of due diligence which you have to carry out – grants are very similar to equity funding in this respect. You have to approach them with the right level of seriousness. Open Calls – generally very well publicised, with quarterly deadlines, and to which anybody can apply. These are highly competitive by their very nature. Sector Specific – Health, Digital, Materials, Manufacturing, Transport, Robotics, Infrastructure & Energy are some of the common sectors covered. Since they are specialised, these receive a significantly smaller amount of applicants. Innovate UK is the main funding body providing R&D grants in the UK (equivalent to H2020 in the EU, which runs in a similar way). The amount of funding available is similar across both open call and sector specific grants. It is reasonable to think about an early feasibility grant (£25-£50K), carrying out a technical, commercial and feasibility study; and beyond that, looking at prototype testing, and getting closer to a commercially ready product. Innovation – You've really got to drill down on what is novel and innovative about your product or service, from a technology point of view, as this is exactly what's going to make a difference in the eyes of the assessors. IP – includes patents & licensing, and will show the funder that the technology you're developing is actually yours, and you are not in breach of any existing patents. As Dom outlined, strong IP can subsequently greatly increase your company's valuation. Market & commercialisation – you need to have an understanding of your competitors, and how you differentiate from them, as well as come up with a plan for the commercialisation of your product: how are you going to take the outputs of your project successfully to market? Forecasts – funders see a lot of hockey stick forecasts, and it's fine if that's what you're anticipating, but why have you calculated it in that way? The more time you can put toward developing forecasts, the more compelling your case for a grant will become. Be specific, realistic and honest, and show evidence to back up your claims. Fit to scope – every R&D grant funder will publish a scope which describes size of fund, criteria, qualification, and the kind of projects they'd like to see brought forward. You have to make sure that you fit this criteria. Funding need – grant funders like to see themselves as a funder of last resort. You should be able to convince them that you've explored other types of funding including equity and debt, or even ICO before reaching the grant stage. When writing a grant application, think more in terms of writing an academic paper than a marketing piece: you need to be able to show a high level of expertise when describing your patent, while also linking it with the commercial side of the equation. A lot of applications fall short on either one or the other, so make sure to demonstrate both very thoroughly. If you can show that your proposed solution out-performs the current best-in-market and makes quantifiable cost and/or efficiency savings, then you might be in with a good chance of securing a grant which will provide the capital boost your organisation needs, helping you realise your ambitions. Check out the Granted Consultancy website for a list of the top grant funding schemes currently open, and get in touch with their team if you would like to receive help with making your application! Not ready to apply for grant funding? Why not discover your equity funding options at our Investment Conference, which will take place on Nov 13, or alternatively, discover a wider array of alternative funding options at our flagship exhibition BFS '19, which will take place on Feb 21! Click here to book tickets.